NEW YORK (Reuters) - Reclusive rocker W. Axl Rose was on his best behavior as the new-look Guns N' Roses played its first concerts in more than three years over the weekend and dusted off a few songs from its long-delayed album. / Guns N' Roses performed nine of the 12 songs from its 1987 debut album "Appetite for Destruction," including "Welcome to the Jungle" and "Sweet Child O' Mine." Other crowd pleasers included "You Could Be Mine," "Live and Let Die," and the ballads "November Rain" and "Patience." / The new addition was Ron "Bumblefoot" Thal, an obscure New York City musician hired last week to replace enigmatic guitar wizard Buckethead. 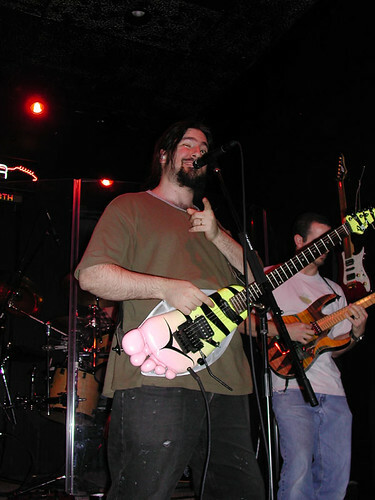 Occasionally, Bumblefoot played an unconventional guitar modeled to look like a hybrid between a bee and a foot, complete with retractable wings.